Hello! Because of the need to bring the tomato season to a close, we will all be receiving green tomatoes in our veg share this week. To help us deal with this sudden glut of the green stuff, Sims Hill member Naomi Woodspring provides us with the following recipes. Enjoy! In the States, one of the joys of the end of harvest season is green tomatoes, especially in the South. Below are some of my favorite preserving recipes. Jars should be sterile, etc but I’m not going to go into those instructions – they are easily found online. These recipes are all in American measurements (cups, teaspoons, etc) again, equivalents are easily found online. Simmer all together for 10 minutes or so, then seal hot in hot jars, leaving ¼ inch head space. Soak overnight in this liquid small whole tomatoes, well washed, as many as can be covered by brine (they can be quartered if they are too big to be used whole). The tomatoes should remain submerged in the pickling liquid which done by setting a plate on top of the bowl and then putting a brick or other heavy object on the plate. Now fork the tomatoes into hot jars then make sure the soaking liquid is boiling fairly briskly, add enough to cover the tomatoes leaving ¼ inch or so of head space. Put the same assortment on top as you put in the bottom of the jar. Remember these get mellower with age. One of my favorite uses is a small one in a martini. ½ teaspoon allspice, nutmeg, ginger and salt. Bring to a boil, turn the heat down and simmer until thick. Seal in hot jars, leaving ¼ inch head space. And finally, green tomato pie is excellent. There are lots of recipes on the web to choose from, depending on how spicy you like things. 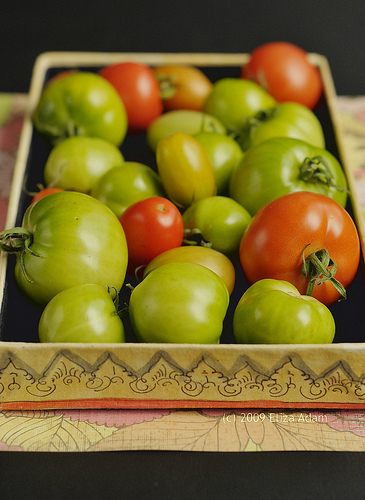 I have been ripening my green tomatoes for several weeks in a large box, each tom separated by newspaper so they don’t touch and with the lid on tight so they are in the total dark. Every few days I open it up to find more red toms. They are much less delicious than ripe from the bush but good to cook with.